"Every day we are hearing about and learning about new technologies built on the blockchain,” said Michael Devine, senior producer for the Innovations television series. 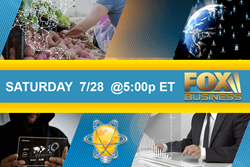 New episode of Innovations with Ed Begley, Jr. airing on July 28, 2018 @5:00p ET via FOX Business. Check your local listings for more information. First, viewers will learn how FOODCOIN ECOSYSTEM plans to support food and Ag startups with the verified model, innovative content, and the significant growth potential using the platform of 1000EcoFarms and FOODCOIN blockchain. The show will focus on how the FOODCOIN ECOSYSTEM will unite economic agents (sellers, distributors, buyers, banks, insurance, logistics companies, tax services, etc.) into a single blockchain platform and introduce the real use cases of FOODCOIN ECOSYSTEM early adopters (5 companies in the US and Europe). Next, the show will focus on Viola.AI, a new technology that uses artificial intelligence to create and sustain successful and happy relationships for both singles and couples. Viewers will learn how Viola.AI harnesses on artificial intelligence, blockchain, and smart contracts to revolutionize the dating and relationship space around the world. Innovations will also explore Coinfirm and how its technology allows for quick and accurate decisions. A global leader in Regtech (Regulatory Technology) for Blockchain and cryptocurrencies, the Coinfirm Platform allows blockchain entities and cryptocurrency to fulfill regulatory compliance and integrate with the mass market. Coinfirm’s infrastructure consists of one of the most comprehensive structured blockchain database and uses big data algorithms for preparing actionable reports and data led solutions. With a focus on fidentiaX – the world’s first marketplace for tradable insurance policies powered by Blockchain Technology – viewers will learn how fidentiaX’s membership-based ecosystem provides a liquidity alternative to existing policyholders through a transparent, fair, and efficient platform, which allows tokenization of their existing policies. Spectators will see how fidentiaX is developing a trustless marketplace for buyers exploring tradable policies as part of their investment portfolio by leveraging on blockchain technology and its benefits to provide a secured transactional ecosystem.